The other day I saw a man walking with what I thought was a small black dog, but at second glance I realized he was walking his black cat and both were enjoying it. The cat was full of confidence and so was the man – a perfect picture indeed. 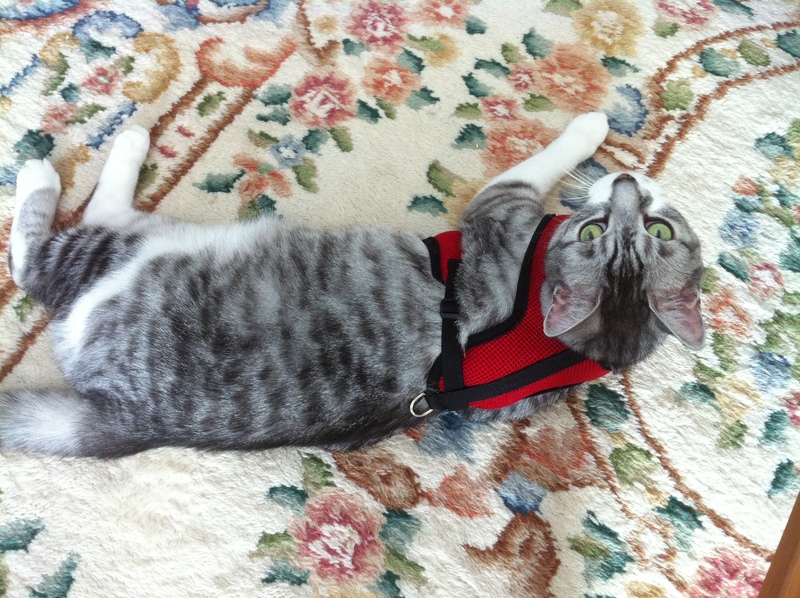 A few years ago I moved from a house into a condo and felt really bad that Spinner no longer had huge picture windows full of trees, squirrels and birds to view everyday and since he is strictly an indoor cat, I figured I would try to train him to wear a harness so I could give him supervised outside time. Anyone who has tried to train or has successfully trained their cat to wear a harness and walk with a leash knows it’s not that easy. Some cats take to it really quickly and others may require time, patience and positive reinforcement aka lots of treats. Spinner looks so pretty in his bright red harness! I followed all the suggested protocols over an extended period of time even purchasing another style harness before he would move when it was placed on him. We made it this far…. Spinner made it just outside the door. As soon as the harness was on, he would flop over and forget how to walk, this is a relatively common phenomenon called “Cattus Floppus Frozus”. 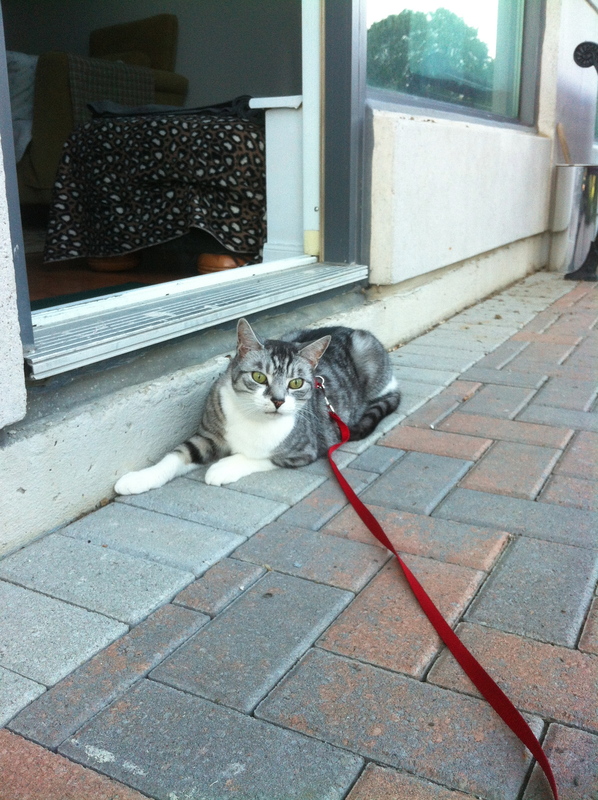 Sadly my dreams of walking my handsome Silver Tabby on a leash among the green grass died that day. Since he clearly wanted nothing to do with it I decided to retire the harness and leash and leave Spinner to look out from the window contemplating what might have been. If you are interested in introducing your cat to the outdoors via this method be sure to check out helpful tips here and, just like that man walking his black cat, you and your feline companion can be on the way to strutting the streets the envy of pet parents everywhere. 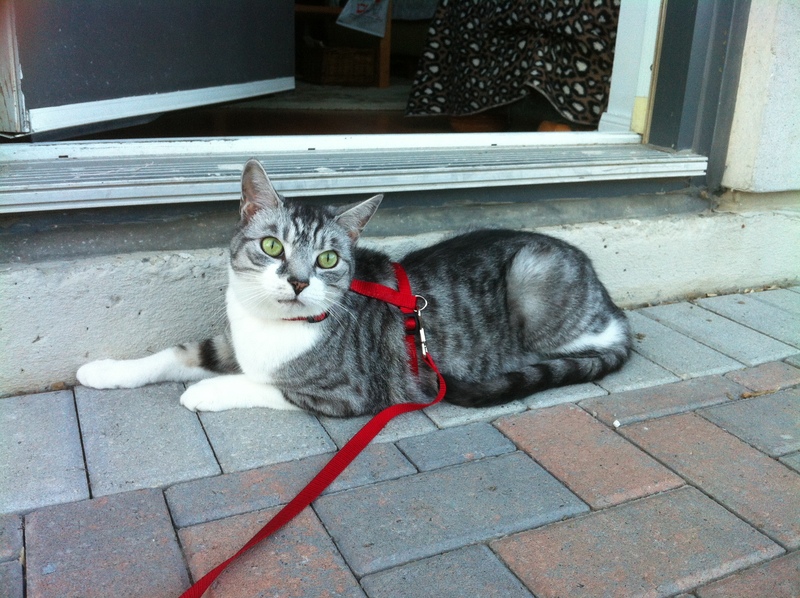 This entry was posted in Feline Fun and tagged harness for cats, outdoor tips for cats, walking cats on a leash by Purr and Roar. Bookmark the permalink.